What does Proposition 39 mean for California solar energy projects? | West Coast Solar, Inc.
What does Proposition 39 mean for California solar energy projects? In November 2012, California voters overwhelmingly supported the passage of Proposition 39, which closed a corporate tax loophole and raised $1 billion in revenue annually, half of which would be allocated for clean energy projects and efficiency improvements at educational facilities. Now that Prop 39 has become law, many are wondering about the next steps for institutions that hope to receive grants from the bill. One of the provisions described in the legislation was for the creation of a Clean Energy Job Creation Fund, from which grants will be paid to local education agencies (LEAs) who can use the money to fund energy efficiency improvements, such as upgrading electrical systems, insulation and water heating methods. While the proposed legislation included the language “clean energy installations” as one of the types of projects that would be eligible for funding, RunOnSun.com, a solar industry blog, notes that a recent bill introduced in the California Senate excludes this particular wording while leaving in all the other categories of improvements that may be considered for grants. So will Bay Area solar photovoltaic (PV) projects be considered for funding? At the moment, the answer remains unclear. Institutions can now begin preparing grant applications for the Clean Energy Job Creation Fund to be submitted to the California Energy Commission, and the Commission hasn’t stated that such projects would be ineligible. 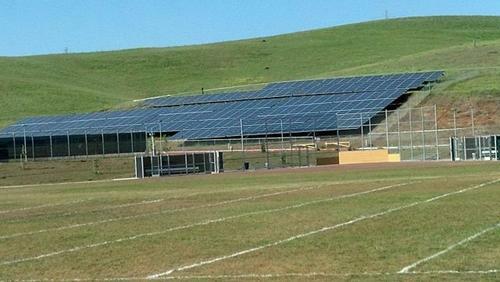 It is therefore advisable that agencies hoping to use Prop 39 revenue to fund the installation of a solar PV system file an application as soon as possible, in order to increase their chances of winning a grant. The deadline for applications is August 1, 2013. West Coast Solar can help institutions come up with a plan, design and cost estimate for a solar energy system. Contact us today at (877) 379-3448 for more information.